Jimdo markets itself as an extremely easy-to-use website and online store builder that lets you construct a site really quickly. But can it compete with the big players like Wix, Squarespace and Shopify? In this Jimdo review, we look at all the platform’s pros and cons, and help you to decide if it’s the right solution for you. You can also use it to manage email accounts. This platform allows you to use ‘out of the box’ templates provided by Jimdo or your own CSS and HTML code. How many people use Jimdo? And why does this matter? Jimdo powers 20 million websites worldwide, which are supported by 200 employees, working in nine languages. The company was founded in 2007. For perspective, Wix has 120 million users and 1800 staff and Moonfruit has 5 million users (no data is available on the number of Moonfruit employees). It’s not clear how many people use Squarespace, but the company states that it has ‘millions’ of users, and 800 staff. All these numbers matter, because there are a LOT of website building companies now providing website building services — some of which only started up very recently and don’t have many paying customers. Using a brand new platform to build your website on carries risk — if the company folds, your website may well go down with it. Although Jimdo isn’t the biggest fish in the pond, it is nonetheless a reasonably large and well-established company with a sizeable userbase — so using its platform to build your website is a reasonably safe bet, as the company is likely to keep the product updated to reflect new developments in website design, and is less likely to disappear, taking your website with it. Jimdo may be a safe bet, but it is it a good one? Let’s drill down into pricing and features. There are five Jimdo plans available: ‘Play’, ‘Start’, ‘Grow’, ‘E-Commerce’,and ‘Unlimited’. €9 in Eurozone countries ($10.30). So, how expensive Jimdo is will very much depend on your location: the company doesn’t really seem to go in for currency conversions which are appropriate for local markets. This contrasts negatively with other similar platforms — several of Jimdo’s competitors do make allowances for currency variations. Access to a wide range of templates which you can use to build your site. As you go up the pricing scale, you get access to more features. So let’s take a look at the key differences between the three plans. Jimdo’s free plan lets you build a 5-page website using a Jimdo subdomain (i.e., www.yourdomainname.jimdo.com rather than yourwebsite.com). It comes with 500MB storage, 2GB bandwidth and https encryption. Interestingly, you also get support on this plan, although you may have to wait a while for it (more on that later). There is enough storage provided on this plan to host a small but functional website; and the bandwidth is adequate for sites that receive a relatively low number of visitors per month. If you plan on offering your visitors large downloads however, you won’t really be able to do this using this plan. A clear drawback of the Jimdo free plan is that websites created using it might feel a bit ‘cheap’ due to the fact that they are not hosted on a company domain. Additionally, the free plan places a small ad for Jimdo at the bottom of each page, which will make any sites created on this plan that bit less professional. Perhaps most significantly, you can’t really tweak basic SEO settings for any site created using the free plan - you can only edit the title and meta description for the home page of your site. And finally, there’s no support included with this plan — so if you get stuck, you’re on your own. Ultimately the free plan is good for trying out Jimdo, and might be adequate for users who have absolutely no budget and very simple requirements — but it’s not a professional solution and anyone with more serious requirements will need to upgrade to a paid-for Jimdo plan. Jimdo Start is the cheapest paid-for Jimdo plan. It includes a free domain name for the first year along with 5GB storage and 10GB bandwidth; and your site can have up to 10 pages in it, which will be adequate for most small businesses. You also get Jimdo’s standard support, which means you’ll receive an answer to support queries within 1-2 business days. Your website will also be ad-free. Storage and bandwidth will be adequate for a lot of small and medium-sized business, but having to wait for 1-2 days to get an answer to a query is not ideal if you need to fix something quickly. Unlike the ‘Play’ plan, you can connect G Suite to your domain on this plan (meaning you can set up yourname@yourdomain.com email addresses etc.). You can use simple email forwarding on this plan too. Importantly, SEO features are included on the ‘Start’ plan, as is support. E-commerce features are missing however, so you won’t be able to sell anything using this plan. All in all, the ‘Start’ offering is pretty good value for money — you can build a pretty nice looking site with it without breaking the bank. It’s not a plan for high-end users, but it will work fine for a lot of small business owners on a budget who need a ‘brochure’-style site to showcase their services. The ‘Business’ plan isn’t terribly different from the ‘Start’ plan — all its features are the same, but there are more generous limits for storage (15GB), bandwidth (20GB) and the number of pages you can put on your site (50). To be honest, unless you desperately need more than 10 pages on your website, or expect a reasonably high number of visitors from the get-go, the ‘Start’ plan is just as good as this one. As the name of this plan suggests, it’s the first one to offer e-commerce functionality. With this plan, you get all the features of the ‘Grow’ plan (the same bandwidth and storage limits apply) but crucially you can build an online store with it too. Your store can host an unlimited number of products. This plan is basically the same as the Jimdo Ecommerce plan, but provides you with unlimited storage, bandwidth and pages. Now, unless your site is insanely successful from the moment of launch, you’ll probably find that you don’t have a big need for unlimited storage and bandwidth. If you want to use e-commerce with Jimdo I’d probably be inclined to start with the ‘Ecommerce’ plan and see how things progress before paying an additional $20 per month for the unlimited bandwidth, storage and pages. More useful perhaps is the ‘professional design analysis’ service that is included in this plan. This gives you some consultation time with a Jimdo designer, who will sense-check your site design to ensure that it is of a suitably professional standard. How does the pricing compare to packages offered by other website builders? Jimdo gets a thumbs up for offering a free plan — several of the company’s leading competitors do not, Wix being a notable exception. And there is quite a lot to like about this free plan — you don’t have to enter your credit card details to avail of it; there is no time limit or pressure to upgrade; and whilst the Jimdo advert at the bottom of the page isn’t ideal, at least it is is fairly small and unobtrusive. considerably cheaper than Shopify, which costs between $29 to $299 per month. For me, price usually isn’t the main aspect to use when judging a product like this, however. Let’s take a look at some of the features. To build a site using the Jimdo interface, you can choose between two modes: ‘Dolphin’ and ‘Creator’. • In ‘Dolphin’ mode, the system uses what it terms as ‘AI’ to build a basic website for you, based on your answers to a handful of questions and material pulled from your social media profiles. This only takes a few minutes. 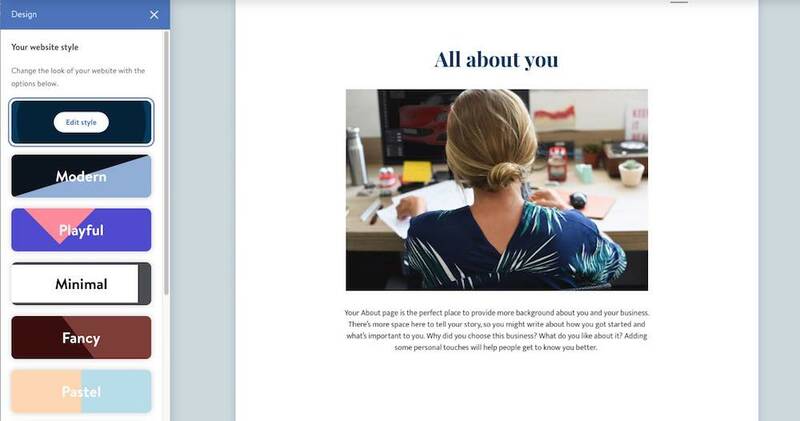 • In ‘Creator’ mode, you build your website yourself, using one of Jimdo’s 40 templates; these allow you to include significantly more features including galleries, background videos, a blog and an online store. When you choose Jimdo’s Dolphin ‘AI’ mode, a chat window pops up, asking you a few questions about yourself, the kind of site you would like to build and the style you’d like to apply to it (‘playful’, ‘elegant’, ‘modern’, ‘minimal’ etc.). Based on these answers, and material pulled from your social media accounts, Jimdo will then build a site for you. This can be a bit hit and miss. When we tried using this mode, Jimdo built a website for a dog training school, a hotel and – this baffled us the most – the Haringey Green Party (to which we have no connections at all). Although the resulting site looked professional and took under three minutes to build, the content was fairly irrelevant. We tried again and asked Jimdo to design a site without using material from the web. This time, it came up with a slicker site (again, in less than three minutes). After that, it was very quick and easy to change text and images and we could easily add two more pages. Although we didn’t end up with the site of our dreams, it was a perfectly acceptable result. It’s fair to say that Jimdo’s AI mode is straightforward to use and that you don’t need any experience using website builders or software knowledge to get a decent-looking website up and running with it. However, Dolphin mode only allows you to make basic changes to your site; and it doesn’t seem to be possible to switch to Creator mode once you’ve built your site in Dolphin. In ‘Creator’ mode, you can build websites using Jimdo’s templates and a full website builder. It’s also easy to use, but offers a much broader range of features than ‘Dolphin.’ It provides significantly more control over the design of your website, along with full e-commerce and blogging functionality. Overall, Jimdo’s Creator interface is clean, and very user-friendly and intuitive to use, even for people with no web design experience. If you wish to get your hands dirty with code, you can easily access the CSS of your Jimdo site; this gives you additional control over your site design. You can also add HTML via widgets that you can drag and drop around your pages. Your Jimdo website is live immediately, unless you create an ‘Under Construction’ page. Blogging is essential for any business, as it’s usually the main part of a successful inbound marketing campaign, and a key driver of traffic. Helpfully, Jimdo provides simple blogging functionality on all its plans (the free one included). This covers the basics reasonably well: you can schedule posts, edit their URLs, and include social media sharing buttons on them. For reader comments, you can either use the built-in Jimdo system, which is a bit basic, or work with Disqus, which offers more advanced commenting features, such as threaded discussions. Jimdo’s blog is also compatible with the Facebook commenting system. As you might expect, blog posts can be categorized (using both tags and categories) or archived. As with much else in Jimdo however, the blogging features are essentially aimed more at basic users rather than professional ones. Arguably the most significant omission from the blog is multiple contributor functionality. Because multiple staff accounts are not possible on Jimdo, you can only have one contributor to your blog — thus making it hard to turn your Jimdo site into a professional publication involving a wide range of authors. And in my latest test of Jimdo’s blogging functionality, I couldn’t find an easy way to embed blog content on other pages of my site. There used to be a widget available to do this, but it seems to have been removed. So ultimately, although the Jimdo blogging functionality is adequate (especially in combination with commenting tools), it can’t compete against a dedicated blogging platform, such as WordPress. On the plus side however, it is very easy to start blogging with Jimdo — other more professional solutions, notably Wordpress, have a slightly steeper learning curve. The main ‘Jimdo’ app lets you build or edit a Jimdo site (we are not sure how many users would really want to build a site on a phone, however…). Jimdo Live Chat, as the name suggests, lets you provide support to your customers. Jimdo Analytics lets you monitor your Google Analytics data. Jimdo Boost allows owners of websites created in ‘Dolphin’ mode to view analytics data and access suggestions from Jimdo on how to market their site. In terms of how these compare to the apps offered by Jimdo’s competitors, most competing platforms come with apps that provide a similar range of functionality (with the exception of Bigcommerce, which oddly doesn’t provide one). A key drawback of using Jimdo to manage a website is that you can’t import or export content or products. As Jimdo is arguably geared more towards website building novices than professionals, the lack of an import tool is annoying, but not a dealbreaker for most, because it’s likely that the majority of Jimdo customers are building a (fairly simple) website from scratch. The lack of an export tool is a more serious issue, because if you outgrow Jimdo and need to switch to another platform, you won’t be able to export your content easily and may have to manually enter a lot of content or product data into your new site. This is of particular relevance to users who use Jimdo for e-commerce purposes and end up with a large inventory of products that they eventually need to migrate to another platform. When you start building your site in Jimdo’s ‘Creator’ mode, you are asked if you’d like to build a website, store or blog and, on the next page, what your field is (for example Photographer and Portfolio, Bar and Restaurant, Community and Clubs, Fashion, etc.). You are then presented with a choice of 15 appropriate templates. Once you have chosen one of the initial 15 templates, you are not stuck with it — you can choose from a total of 40 templates at a later stage if you wish. It’s worth noting here that other website builders offer a far greater choice of templates. For example Wix, which operates at a similar price point, offers a selection of 500+ templates. Squarespace provides around 80 very professional-looking templates. Jimdo’s limited offering in the template department means there may not be one that appeals to you, suits your business or can be configured to accurately reflect your brand. On the other hand, if just need a web presence quickly and aren’t too fussy, the fact that there aren’t hundreds of templates to scroll through makes things quicker – too much choice can be paralysing, especially if you find it hard to visualize the end result. Another plus is that you can switch between templates without losing any content, which will appeal to people who are not experienced when it comes to building websites and would like quickly try out a few different looks. Jimdo is much better than Wix in this regard — you can’t switch templates in Wix without losing all your content (Squarespace also makes it a bit trickier than it should be to switch templates). Finally, if you know how to code, you can build your own templates, facilitated by Jimdo’s design kit. Jimdo’s templates are arguably outclassed a bit by those offered by competing products like Shopify and Squarespace, but they are nonetheless professional in appearance and it is definitely possible to put an attractive site together using them. It’s worth noting that the navigation in Jimdo templates only goes as far as two levels, which may not be enough for users who plan to include a lot of pages or content on their site. That said, most similar products don’t really facilitate complex navigation structures either — the expectation is that two is enough. And from a usability point of view, it usually is. All sites created using Jimdo are mobile responsive. 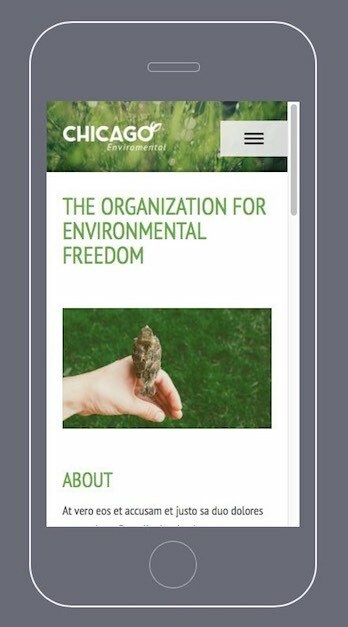 You can check how the site is going to display on smartphones by clicking the mobile icon at the top-left corner of the Jimdo interface. Oddly there isn’t a tablet option too, however, but as Jimdo sites are responsive, you shouldn’t really expect any big problems here. All in all the Jimdo offering in the template department is solid: the templates may lack a certain ‘wow’ factor that you get from those provided by some other website building tools, but they are decent, and most users will be able to find a Jimdo template that meets their needs without too much difficulty. If you plump for one of the more expensive Jimdo plans (the $19 per month ‘E-commerce’ or $29 per month ‘Unlimited’ options), you get access to e-commerce functionality. Setting up an online store using Jimdo is a fairly painless process — and you can do it quickly. You can add products, set terms and conditions for your store and create automated response emails easily. When somebody places an order on your website’s store, you will get a notification on your site dashboard, and via email too. You can easily access store orders and tick them off, or export your list of orders in CSV or XML format if you’d like to process them externally. You can also track your inventory via Jimdo and specify the number of items currently in stock. If you run out of a particular item, Jimdo will automatically place a ‘sold out’ notice next to it. Jimdo doesn’t have its own payment gateway, but facilitates payments via PayPal and Stripe. These companies take a small percentage of each transaction, but unlike some competing website building products, Jimdo does not charge any fees for sales made from your site. You can only sell using one currency: Euros. This is quite remarkable and will immediately rule Jimdo out as an e-commerce platform for an awful lot of users. There is no abandoned cart saver. You can’t set up multiple staff accounts to manage your online store. You can’t create a ‘buy now’ button for use on external websites or social media profiles. You cannot import or export product data. Selling digital products involves a long-winded manual process of setting up passworded pages. All in all it has to be said that as things stand, Jimdo should not be viewed as a professional e-commerce solution. It’s fine for users who want to run a small content-based site and sell some products occasionally on the side, but if you’re serious about e-commerce and want to use a hosted solution, you will be much better served by a dedicated e-commerce platform, like Bigcommerce or Shopify. Even other products which are more ‘general’ website building tools (such as Wix and Squarespace) provide signficantly better e-commerce functionality than Jimdo. One way of getting around Jimdo’s relatively poor e-commerce functionality of course is to use another app in conjunction with the platform — it’s easy to embed an Ecwid store or Shopify catalogue into a Jimdo site, using a simple code snippet. This can open up a lot more selling functionality for your Jimdo site, not least the ability to sell in a currency of your choosing, dropshipping and abandoned cart functionality. Unlike other site and store building platforms, there’s no ‘app store’ available containing integrations with third-party tools and add-ons to beef up the functionality of your site. That’s not to say that you can’t integrate your Jimdo site with other tools; many third party apps provide code snippets (or widgets) which can be added to a Jimdo site (via its ‘widget’ or ‘HTML’ elements) to provide additional functionality. This is fine for adding things like forms, calendars or maps to a Jimdo site (capturing basic data or displaying it, essentially); but if you’re looking for deep integration between a Jimdo site and an accounting, CRM or dropshipping app, you’re likely to be disappointed. Jimdo allows you to add forms to your site easily; these allow visitors to message you or subscribe to newsletters. You can add several different types of field to your form, with one notable exception: a file upload field. If you want to allow users to send you files through your forms, you’re going to have to turn to a third party solution such as Wufoo or Jotform. Form submissions are automatically emailed to an address you specify; they are also saved in the back end of Jimdo. Unfortunately, there’s no automatic way to send the data you capture via a Jimdo form to an email marketing app like Getresponse, Aweber or Mailchimp. If you want to do that, you’ll need to grab form code from your chosen email marketing provider and embed it on your site using one of Jimdo’s widget/html elements (which is better than the alternative of manually copying and pasting email addresses into your chosen email marketing tool). Jimdo provides a basic reporting dashboard which allows you to get top-line stats on your website. For more in-depth analysis, you can also use Google Analytics with Jimdo, by adding Google’s code to the header of your site. You can then access Google Analytics data within your Jimdo dashboard, which is convenient, or simply use the full-blown version of Google Analytics. Jimdo’s SEO features are pretty comprehensive. What you won’t have control over is the speed of your hosting — unlike a Wordpress setup you won’t be able to host your site on ultra-fast servers (you’ll be stuck with Jimdo’s setup, which whilst acceptable, won’t necessarily be the fastest hosting on the block). But that’s part and parcel of using any hosted solution really. Finally, unlike competing platforms, you won’t be able to add any SEO plugins or apps to your Jimdo site, although you can make use of resources like Google Search Console, Pingdom, Yoast’s Real Time Content Analysis tool, Hubspot’s Website Grader or — and here’s a little plug — the Style Factory SEO guide to help you evaluate and steer your search engine optimisation efforts. When adding or editing elements of a Jimdo site, a “?” icon is displayed. Clicking on this gives you basic help on the element you’re working with. This is usually pretty good. You can also make use of Jimdo’s Support Centre when creating your site - this contains useful videos and articles to help you build and edit your site. Jimdo provides a useful blog called ‘8 Days’, which deserves a mention here. This well-written and informative blog provides good advice for online businesses, covering key subjects such as SEO, online marketing and automating workflow. The Support Centre can be occasionally a bit confusing at times however, because a lot of the resources still seem to refer to old Jimdo plan names (“Free”, “Business” and “Pro”). And Jimdo seems to be unsure as to whether its ‘Dolphin’ website building tool (which as discussed above creates your site automatically for you based on questions you answer) is called ‘Dolphin’ or ‘AI’. The end result is more confusing support materials! If the above resources don’t meet your requirements, and you need to contact Jimdo directly for support, you can only do this via email — there is no live chat or phone support available. If you’re on a ‘Start’, ‘Grow’ or ‘Ecommerce’ plan, you are guaranteed an answer in 1 to 2 working days; on the ‘Unlimited’ plan, you can expect to receive it in under an 1 hour. This level of support isn’t ideal — a 2 day wait to get an answer could prove very frustrating (especially if you need to send a few emails back and forth to resolve an issue). And the fact that support is only available on weekdays means that if something goes wrong on Friday afternoon, you may not have a fix for it until Monday. As with the Support Centre, when you go to the contact details section of the Jimdo website you are presented with support options for plans whose names are out of date (‘Free’, ‘Business’ and ‘Pro.’). Again, rather confusing. Ultimately it’s a ‘could-do-better’ for Jimdo for its support offering. Several competing platforms provide 24/7 support options across more channels (phone, live chat and social media); and the support materials, with their references to old plans, can occasionally confuse. 10. Is Jimdo the right website builder for you? Jimdo’s philosophy is to make the building of websites more accessible or, as the company says, put ‘the power of website creation in the hands of ordinary people’ to allow them to share their passions online. Their free plan arguably meets this goal – it’s a fairly generous offer, which allows anybody to get a web presence together quickly and easily. For anyone wanting to build a simple website quickly and without too much fuss and deliberation, Jimdo is a good option. As far as the paid plans go, the main argument for using them is price. For $9 a month, you can put a fully functional website together using the platform. This is considerably cheaper than if you were to use some competing building solutions, notably Squarespace (the cheapest Squarespace plan is $16 per month). And technically, you can get started with e-commerce more cheaply with Jimdo than a lot of other platforms too - the Jimdo $19 per month plan allows you to build an online store, which compares favourably to Squarespace ($26 per month), Shopify ($29 per month) and Bigcommerce ($29.95 per month). That said, the e-commerce functionality is considerably more basic than these products, particularly where Shopify and Bigcommerce are concerned. So, if your budget is low and your needs are basic, Jimdo is well worth a look. It’s well-suited to small businesses that require a simple online presence and/or shop, but don’t have the budget, expertise or time to grapple with more complex systems. However, those with more advanced requirements will nearly always be better off using another website building platform. If you have serious e-commerce needs, dedicated online store builders such as Bigcommerce or Shopify are going to serve you better; and if you are serious about blogging or running an online publication Wordpress is probably the best solution. We hope you’ve found our Jimdo review useful; below you’ll find our summary of the key pros and cons of the product. As ever, one of the best ways to determine whether this solution is right for you is to try it out yourself - you can avail of Jimdo’s free plan here. A generous free plan is available. It’s easy to use, especially for those without any previous experience of website building. You can edit the HTML and CSS of your site. You can switch between templates quickly and easily, without losing content. There is a good selection of mobile apps available for managing your site on the go. Jimdo is a well-established company with a large customer base, which makes it likely that the company will regularly update its offering and is less likely to fold (thus future-proofing your site). A rather limited number of templates is available. You can only sell in one currency: Euros. You can only use two levels of navigation. Support is limited to email and is not available 24/7. There is no import / export functionality. E-commerce functionality is not as professional as that provided by other solutions, especially where tax rates and dropshipping are concerned. There are no third party apps available. You can’t have multiple contributors to a Jimdo site. You can try Jimdo for free here. There are a lot of similar website building solutions available. If you’re looking for something similarly priced, but with a larger range of templates to choose from, take a look at Wix. Its e-commerce functionality comes in a bit cheaper too. See our Wix review for a full run-down on the pros and cons of this platform. Although it’s more expensive, Squarespace is definitely worth investigating. Its templates are slicker and its feature set is more extensive. I find Squarespace particularly good for users who want to build a content-driven or portfolio website (note: if you’re interested in working with the Squarespace platform, do check out our Squarespace review and our Squarespace web design services). For a those interested in a highly professional e-commerce solution, we’d recommend Bigcommerce or Shopify over any of the aforementioned. And finally, if you're thinking about creating an online publication involving multiple authors and requiring sophisticated content management and publishing functionality, then Wordpress is probably your best bet. Got any thoughts on Jimdo? If you've got any thoughts or queries on Jimdo, or have experiences of using the product that you'd like to share, please do leave a comment on this post - just scroll down to post one. (Reminder: if you've reading this on a mobile, you might be seeing the 'accelerated mobile pages' version, which doesn't display comments. Click here to read the regular version, which lets you leave a comment).